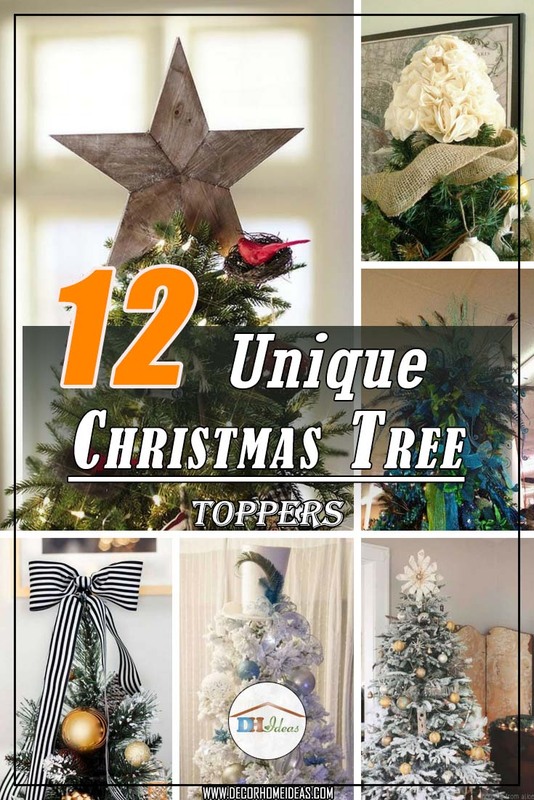 Are you looking for some new ideas for Christmas tree toppers? Here they are, unusual and extraordinary, but still very creative. Although Christmas trees are usually topped with either a star or an angel, that does not mean you can’t break the rules. Why don’t you try something else that’s perhaps a little more modern or that fits better with the theme and style of your décor? You can try with a sea star, a crown, peacock feathers, ribbons, music sheets, and even antlers…Your only limit is your imagination and resourcefulness. Just try to think outside the box and you can come up with a statement solution. Ultimately, your unconventional tree topper might even serve as a great conversation starter for your holiday party or family get-together. Beyond doubt, everyone puts a lot of work into making the Christmas tree look stunning. That’s why an elegant crown seems to be the perfect finishing touch! Just have a look at this lavishly embellished Christmas tree! It is definitely a statement seasonal décor piece, don’t you agree? Somewhat similar to the elegant crown topper idea is to use a beautiful vintage hat. 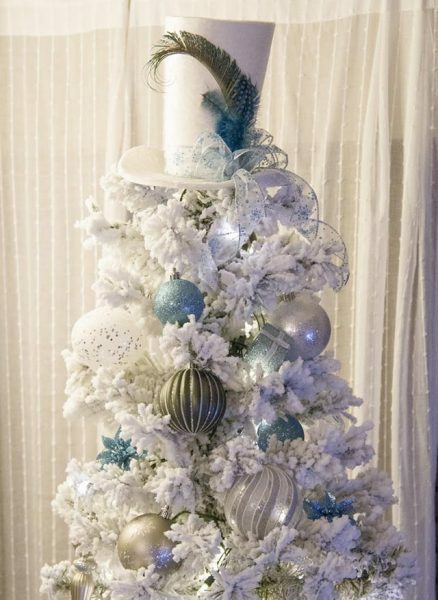 This white Christmas tree topped with an elegant hat looks absolutely stunning! What a brilliant idea! Love the turquoise Christmas color scheme? What about this Christmas tree? Ribbons and feathers in blue and green lend it a peacock-inspired look. Isn’t it charming? Are you a hunter? 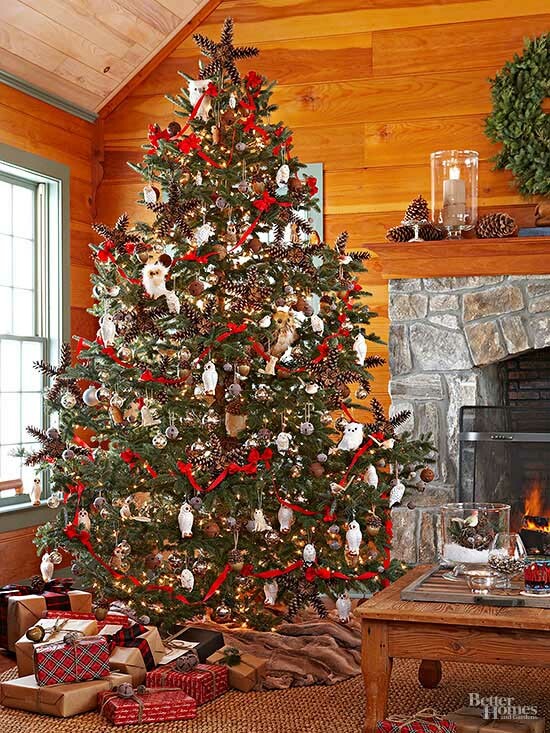 Spending Christmas in a cabin or at home surrounded by rustic décor? Then, why don’t you go for a pair of antlers, real or faux? 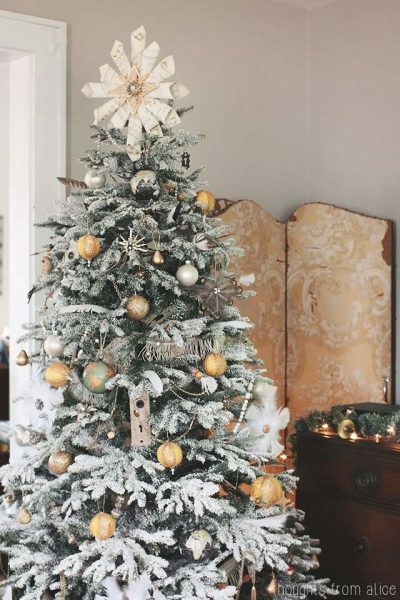 This is definitely an impressive way to both make your Christmas tree unique and add organic touches to the space! Want to try a DIY project? Opt for some old music sheets. Look at this beauty! A jewel piece in the middle of the beautifully arranged sheets adds extra sparkle and visual interest. So creative and beautiful! Pure vintage perfection! Definitely a magical Christmas tree! 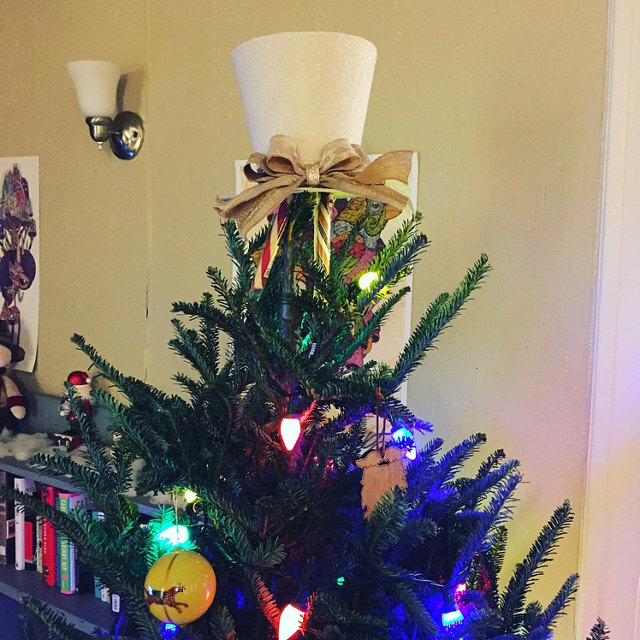 Speaking of DIY projects, try combining a bunch of things into your own tree topper masterpiece. 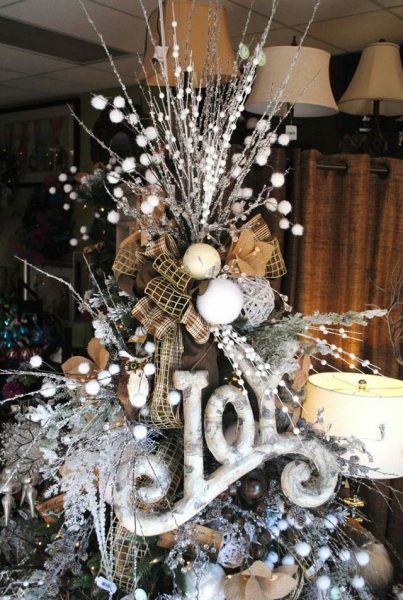 Get inspiration and ideas from the statement Christmas tree shown above! 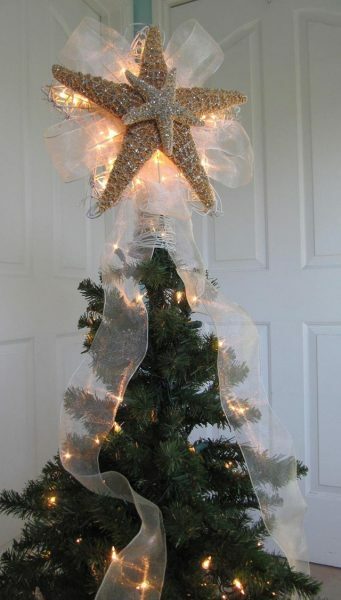 Keeping with at least part of the traditional tree toppers, why not swap out a regular star for a real starfish? This tree topper would look great on almost any tree, but it can turn a beach-inspired Christmas tree into a true show-stopper. It’s the best coastal Christmas tree topper idea. You can even go a step further and combine the starfish with some extra little seashells and pearls. Rose gold Christmas decoration is getting more and more popular so it will be a great original piece of decoration. If you have some spare pine cones you can easily glue them and create another unusual Christmas tree topper. 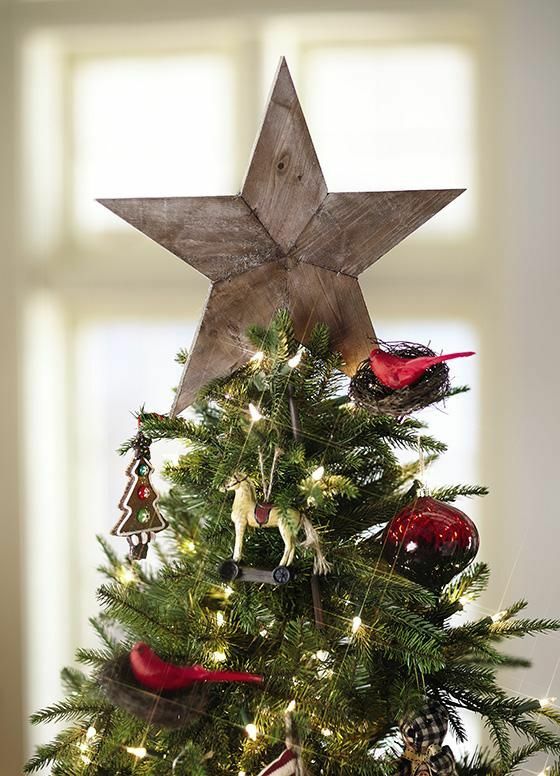 Look out for big pine cones and evenly shaped to create the perfect star. 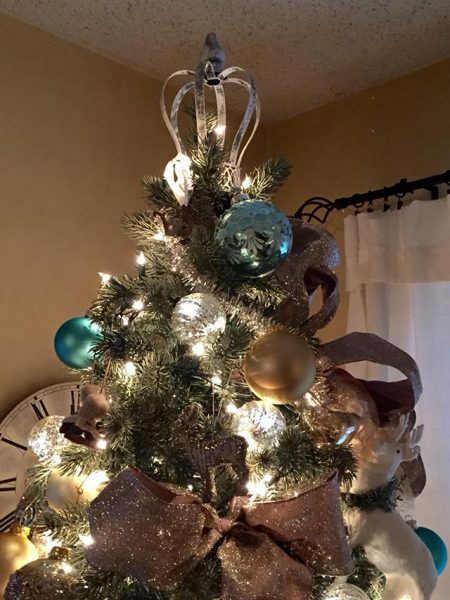 Here’s an elegant way to top your tree. 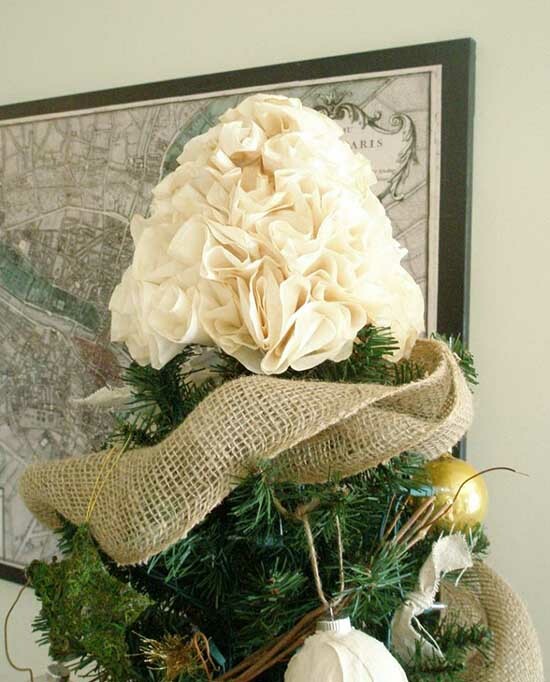 Wrap it with burlap and hang some old school ornaments for a festive touch. 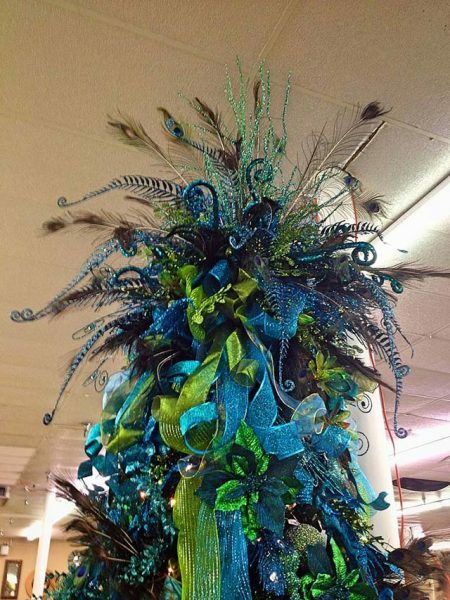 The topper could be made from paper or faux flowers. I’m not sure whether you can DIY this topper or it’s available on sale somewhere, but it’s quite unusual and very rustic. Great farmhouse Christmas decor item that will compliment any rustic interior. Your best Christmas Tree Topper could in Home Depot. 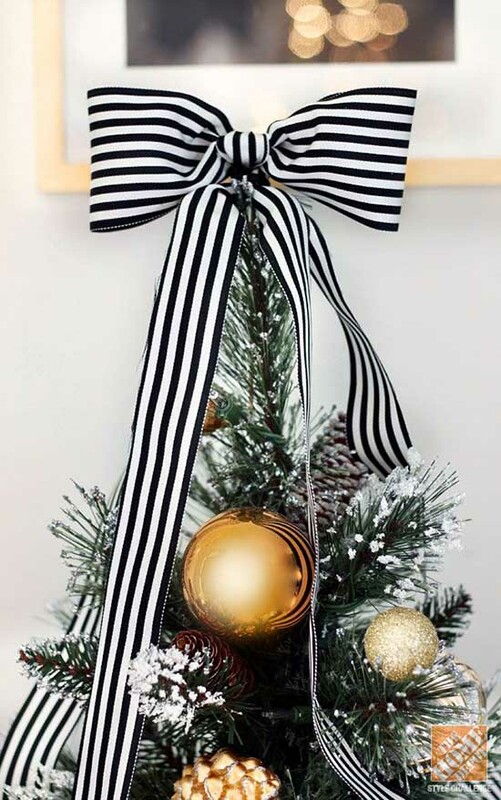 This one is very trendy this year and everyone is crazy about Christmas tree bow topper with streamers trend. We loved this glitter bow tree topper with cascading tails. Decorate the tree with golden lights and ornaments. What kind of a Christmas tree topper are you going to use this year? 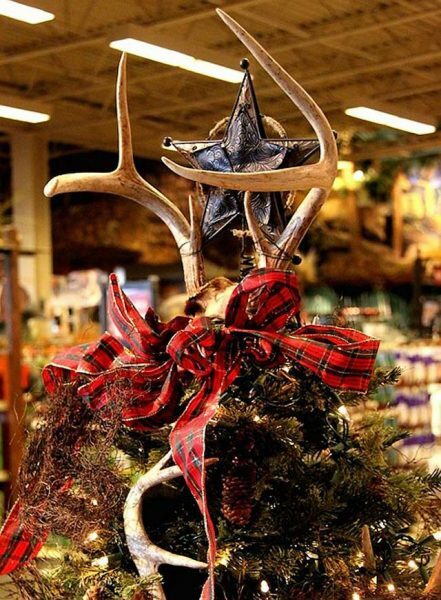 Let this Rustic tree topper bring your tree to life. 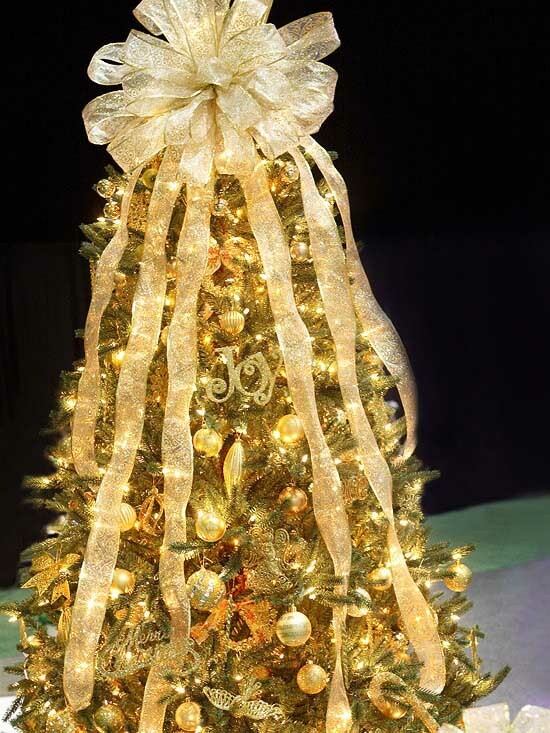 Filled with flecks of gold throughout the beautiful white burlap fabric, this tree topper will glow on any tree or even as a centerpiece for a table. You can even add a monogram letter to make it more personalized.